To a standing ovation of the 4,500 Americans attending the recent AIPAC conference with topic “Israel: Tell Your Story” – whose loyalties are more toward a foreign country (Israel) than the US – Zionist entity’s prime minister Benjamin Netanyahu (Bibi) declared: “The Jewish people were building Jerusalem 3000 years ago and the Jewish people are building Jerusalem today. Jerusalem is not a settlement. It’s our capital”. Now, one doesn’t need a PhD in world history to figure out that Bibi was lying from both sides of his Zionist mouth. Even Israeli professor Shlomo Sand has admitted in his book ‘When and how Jewish people were invented?‘ that modern Jewish people were invented a little more than a century ago. Therefore, Jewish people could not be building Jerusalem 3000 years ago. However, they have been Judeazing Jerusalem city since 1948 when half the Arab Muslim-majority city of Jerusalem (Western) was awarded by the world’s western powers to the European Jews who were not welcomed in the Christian Heartland. The Jews then occupied the Eastern part of Jerusalem with the help of the same western powers in 1967. Historically, Jerusalem existed under the name “Salem” during the time of prophet Abraham 3000 years ago – and Abraham was certainly not an Israelite or a Jew. The entire city was demolished by Babylonians in 586 BC. and rebuilt seventy-year later by Cyrus, the King of Persia, who could not be a Jew. 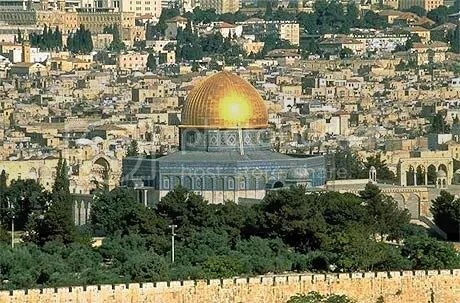 In 40 BC Romans occupied Jerusalem and incinerated the Temple of Solomon (Masjid-e-Aqsa, mentioned as “the Far-away mosque” in the Holy Qur’an). Palestine has existed, though not as an independent state, for over 10,000 years. Its inhabitants have been Jebusites (the ones’ who most probably built the city), Cannanites, Phoenicians, Hittites, Aramaeans, Ammonites, Moabites, Edomites, Arabs, Franks and Turks. Part of Palestine was ruled by Israelite under the name of “Kindom of Judea and Samara” until they were defeated and taken as slaves or expeled by Babylonians, Greeks, Romans and Persians between 171 BC and 135 CE. The City of Jerusalem was handed over to Muslim Army by the Christian Patriarch Sofronius in a public ceremony in 737 CE. Muslims found out that the ruins of Temple of Solomon were used as the city garbage dump. Under the orders of Khalifah Umar Ibn Khattab (ra), the site was cleaned of garbage and handed-over to the Chaief Rabbi of Jerusalem, who in gratitude declared the Khalifah as the “Promised Jewish Messiah”. Sheikh Imran Nazar Hossein in his book Jerusalem in the Quran exposes the Zionist lies about their Biblical claim on the Holy Land. UK and zionist run America – no different. lol… UK and zionist run America? UK is part of the new Muslim empire, haven’t you heard? YEP – how you know that? You mean David Cameron’s great grandmother was not Jewish or the British Opposition Leader, Ed Milliband’s both parents are not Jewish? The hatred in your heart exposed by the content of your blog is sad. Are we not all brothers and sisters of our Father in heaven? I will pray that the eyes of your heart are opened and that the One who is eternal, without beginning or end will give you a peace that passes all understanding. When was the last time you read your Talmud, dear? I read the Word of God every day. I read the King James version of the Holy Bible. Any one can twist God’s Word to suite their own ends, that is a clever strategy of the Ancient Enemy. That enemy who would blind us as such, taking joyful glee when we stand before God in judgment wondering why we are condemned to the pit for eternity for our hateful actions that we deemed justified while on earth. So there is no point in arguing with another over interpretation. I believe that Gods wants to us be loving and merciful towards each other vs. hateful and condemning. “Love God above all things, and love your neighbor as yourself”. That is the base fundamental COMMANDMENT of God. With that commandment, there is no justification for any other behavior, and all who were born into this will world will one day stand in judgment for eternal life or eternal death. King James version is a crap modified by Zionist Christians for their Jewish masters. They even deleted the word “virgin” for Saint Mary. Dr. Robert Funk DDD, an authority on the New Testament wrote in 1991 – *0% of the verses quoted in the NT as being said by Jesus – are added by the interested people and the remaining 20% verses PROBABLY could by Word of God. However, like a brainwashed Christian, he still concluded his statement by saying: “But as a Christian I still believe Bible is ‘Word of God’. “Love God above all things, and love your neighbor as yourself”. Can you list a half-dozen Christian leaders who preach and also practice that phrase? Holy Qur’an says even better: “Wish for your neighbor what you wish for yourself and your family”. But as a professional Zionist propagandist – you totally ignored the contents of the link I provided above. So my advise to creeps like you, is – go and preach your ‘Christian love’ to Israeli Jews who punish a Christian three-year in jail for just gifting a copy of NT to a Jew.